ALVIN, TEXAS: Seaports along the US gulf coast and east coast are gateways for South American wood pulp shipping to converters, printers and manufacturers across the USA. US and Canadian wood pulp mills ship both domestically and export. 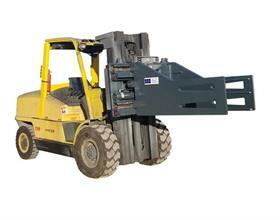 Moving and handling this material demands that forklifts transport as many bales per trip as capacity and space allow. Fork-Co USA's new pulp bale clamp Model GA45F will handle 9,000 lb units of pulp bales stacked in units of 16 bales. Its high strength alloy steel arms are 55 inches in length with an opening range from 25 inches to a maximum of 84 inches. This range allows handling single bales as well as 16 bale units. The GA45F can be either sideshifting or non-sideshifting, determined by the connection to the forklift hydraulics. The clamp has very strong alloy steel arm carrier bars guided in aluminum bronze bushings. The hydraulics are clean and simple, and employ high burst pressure hydraulic hosing. The distribution and lock valve is a manifold and cartridge type assembly for easy service. Designed to work on class IV trucks up to 15,500 LB, the clamp's powerful clamping force ensures the load moves without dropping or sagging. The grip ribbing of the GA45F can handle wrapped or non-wrapped bales equally well. Fork-Co USA. 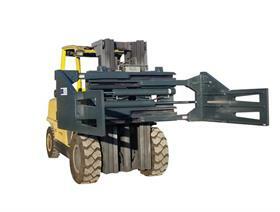 builds forklift attachments under its brand name Unit Load Handling Systems. Fork-Co specializes in providing customized attachments for many industries. Our more than 50 years of application design experience can solve your handling needs. We celebrate 16 years supplying our products to our customers around the world. We thank our many customers for their support and confidence in our designs. And we thank them for all the opportunities brought to us.